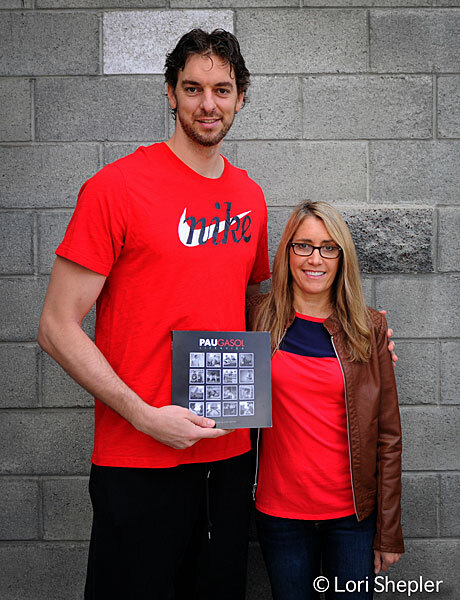 Lori Shepler self-published a book about Lakers star Pau Gasol. Two of the best things to happen in my life were getting hired by the Los Angeles Times in 1983—and getting laid off by the Times in 2009. I had photographed all the sporting events, movie stars, news events, and features that anyone could want, but I was ready for a change. Every six months, newsroom staffers were losing their jobs in mass layoffs, which created a worrisome edge to the job I loved so much. Everyone saw the landscape shifting; the newspaper business was changing. I loved the people I worked with and still approached my assignments with zest and excitement. But I knew in my heart it was time to travel down another road and be my own boss. It turns out, when the Times laid me off in May of 2009, it actually jump started me toward that new path. I had been photographing the Lakers since 1982—first as a freelancer and then for the Times—and enjoyed a great connection with the team. I loved shooting Lakers basketball and also tried to come up with feature ideas. I always felt that fans got to see so much of the players on the court but so little off the court. So I did a behind-the-scenes photo story of the players for the Times during the Shaq and Kobe days. The access was tightly controlled, but at least it gave a glimpse of the players in their hotel rooms and off the court. When Pau Gasol was traded to the Lakers in 2008, I wanted the fans to learn a little about him, so I did a question-and-answer piece with behind-the-scenes photos. As a result, we developed a friendship. Shortly after, I was laid off. That’s when ideas began swirling around in my mind. 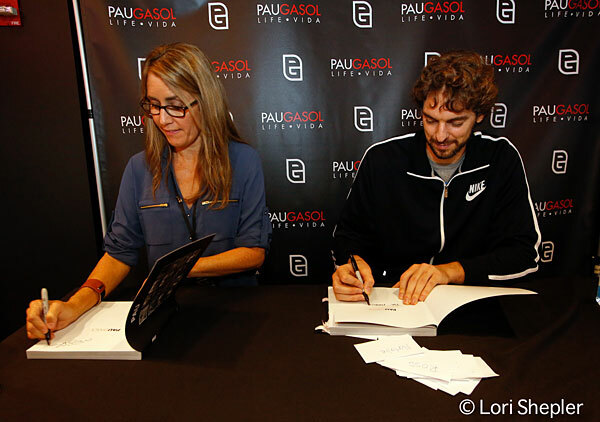 I knew Pau was different than most NBA players and I wanted his fans and the world to know it. I thought making a book with him would be a great idea. So I proposed the idea to him over lunch and told him that we could do it at our leisure, without any deadline pressures. I told him we could start with just behind-the-scenes photos of him both at home and in his off-court activities. I wanted to capture the natural essence of his life off the court. After mulling the idea for about a week, he said "Let’s go for it." He trusted me completely with this idea, just a friend-to-friend agreement that we would accomplish this together. 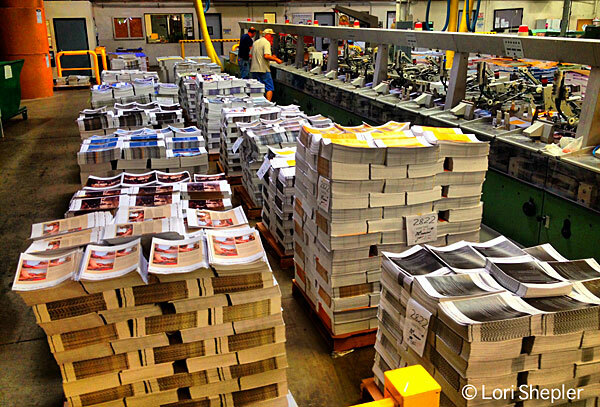 The book at the printer. Pau is a very private guy with a very small circle of friends in Los Angeles. I felt honored to be part of his life and knew he had afforded me a very special opportunity. The very first photo shoot for the project took place at the beach which Pau loves and enjoys escaping to in order to get away and reflect. Obviously, being 7 feet tall, it’s difficult to go incognito. I traveled to Spain to capture him in his home country and that was quite an experience. He is like Elvis over there and is stopped everywhere he goes by his fans. As the project progressed, I realized I wanted to it to be more than just a photo book. So I put on my reporter hat and spent hours interviewing him on different subjects. I knew one of the chapters needed to be about basketball, but I wanted the others to be more about the things people didn’t know. 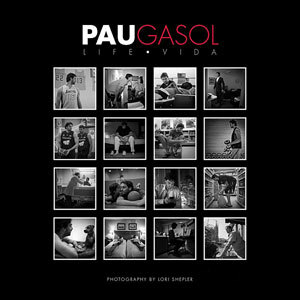 One of the biggest challenges was putting all the photos and Pau’s thoughts into a single piece of work. So I came up with 16 chapters (since his number is 16) and organized all the photos around those chapter ideas. Three years into the project, I knew that I needed to put all the pieces together. Other than actually laying out the book, I thought that I could do it all myself. At around 2 a.m., when I had stacks of transcripts and hundreds of photos in front of me, my girlfriend looked at me and said "You need help." So I reached out to a long time friend, Phuong Nguyen Cotey, who is a two time Pulitzer Prize nominee for feature writing and asked her if she was interested in working with me on this project. She was happy to help out, and in the spring of 2013, we started the creative process of assembling the book. Phuong worked her magic with all the transcripts; I helped in the process, and little by little, narrowed down more than 10,000 photos into those 16 chapters. With the help of my friend, Howard Shen, who is a graphic designer, we methodically designed the book. Pau and Lori with LIFE • VIDA. We had more than 50 versions of each chapter as the three of us came up with different ways to place the photos and tweak the design and the text. Pau has many Spanish and English speaking fans and does all his social media posts in both languages, so I thought it was important to keep it along those lines and make the book bilingual. It was an arduous task of a placing in the Spanish text since it had to match the English exactly. Pau translated the book and also tweaked the English after Phuong had finished her editing. When it came time to work on the forewords, I knew I wanted Kobe Bryant to write it. 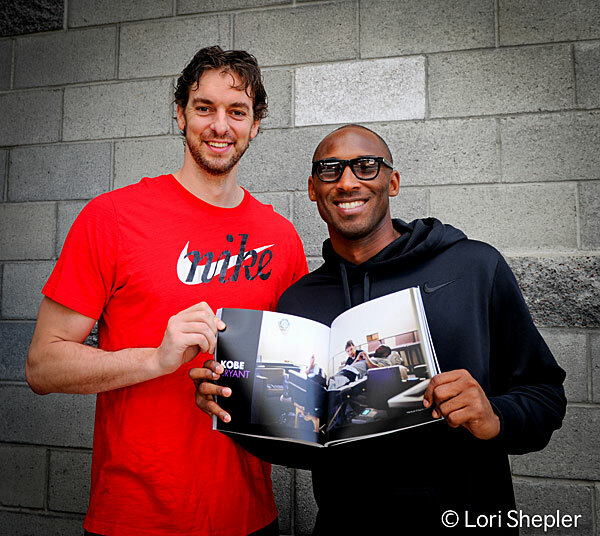 I’ve known Kobe Bryant since he came into the NBA and since he and Pau are quite close, he agreed to do it. I interviewed Kobe and Phuong wrote up the most touching foreword from my transcripts. Kobe received a lot of accolades for his poignant words, which was written in collaboration with Phuong’s expert and creative editing. I’ve been told that is quite an honor since its Kobe’s first foreword in a book. He didn’t even agree to write a foreword in Jerry West’s book. The same goes for Phil Jackson’s foreword in our book. Phil spoke very highly of Pau in the interview and it translated quite well for the other foreword. As the book started to come together, I realized that we had two options for the publishing aspect of it in America. We could find an established publisher and let them handle the fulfillment, publicity, printing, and other aspects of the book, or I could go into it cold turkey and try to accomplish it myself. I'm always up for a challenge, so I thought that I would write up a proposal for it and present it to Pau and let him decide. After a few weeks of researching and gathering advice from friends who are either publishers or authors, I presented my proposal. After thinking about it for a week, Pau supported my idea as publisher. "Wow," I thought. "Not only is this book a huge undertaking and the learning curve magnificent, now I'm the publisher of a book on a very famous and high-profile athlete." I will have to admit that most of the journey up until then, I looked at it as a very low stress, creative endeavor. Now it was crunch time and I had to come up with the printer, the fulfillment place, and a way to get the book out to his fans. And in the meantime, we had to work on a plan to team up with a Spanish publisher since he has such a big following of fans in Spain. After some research and connections through his good friend, assistant, and business manager, Jorge Badosa, we hooked up with Planeta, a huge publishing company in Europe. That took a little weight off my shoulders. They wanted to have their own edition of the book with the text in Spanish only and wanted to use a different cover. The book sold over 7000 copies in Spain in just the first couple months of its release. With some help from other friends who are publishers and authors, I started putting the plan together. People in the book business are so friendly and helpful. I wanted to try to keep the work in America, so I chose Bang Printing in Valencia and a fulfillment place in Riverside called Avanquest. In a way, it was comforting to know that both places were nearby and if I needed to visit them in person, I could. Of course, having the book printed in China would have resulted in a much cheaper price, but it was important to have the words "Made in the USA" on the book. Pau and Kobe with LIFE • VIDA. After about six months of working 10-14 hour days assembling the book and working on the publishing and marketing plan, the book was finally finished. Throughout this whole process, my dad, who lived in Florida, was going through the aftereffects of a stroke and was in an assisted living place. I was able to visit him in the early phases of the book and would call him almost every day. The irony of it all was he was so proud of me and the day that I went to see the first pages of the book come off the presses, was the day that he passed away. Sadly, he never got to see a copy of it. We decided to release the book around the same time that the Spanish publisher did, which was November 26, 2013. It was decided we would start the marketing through his social media channels like Instagram, twitter, and facebook, and then pursue traditional methods, like bookstores and big warehouse stores, at a later date. Nike let us use their store connected to Staples Center for our first book signing last month, so we considered that our official book release. That took a lot of organizing and planning since I had no experience in that realm. With the help of my designer, Howard Shen, we made a step and repeat with Pau’s logo and name of the book for the signing, which turned out visually really nice. Pau did two tweets about it a few days before the event and we had a great turnout. He signed around 275 books in about 90 minutes. Another part of the timing of the release that was so perfect was that he and his brother, Marc Gasol, had created a family foundation, the Gasol Foundation, to help kids lead healthier lives. Pau had decided early on that he wasn’t going to make any profit financially from this book and so he chose to give all of his proceeds from the book to his foundation. The book got a lot of good press in the first few weeks of its release and nice reviews for it being a one of a kind type of book on a very well known athlete. Most people were very surprised at the depth and richness of the book considering they had assumed it was just a photo book. I still work everyday to try to find ways to get the book out to the world. Would I have done anything different on this path? Yes, probably printed a lot less copies, but sometimes it’s a live and learn experience. I believe, eventually, I will find a home for all the books. A publisher’s goal is to always sell enough books to cover the expenses and then hopefully make a little money for all the time put into it. Even if I only make back the expenses, I wouldn’t trade this experience for anything in the world. I've opened up my own Amazon storefront and am the fulfillment person for that. People seem to think that because you have a book with a famous athlete that it is going to make you rich, but it seems like even with all the positive accolades and reviews from the book, his proceeds going to his foundation, and a very affordable retail price, books just aren’t an easy sell these days. Lori and Pau signing LIFE • VIDA. Many people have told me my book should be on the bookshelves of every school, college, and public library since athletes who are true role models are so hard to find. I’ve been told that this book is timeless and it will stand the test of time. Barnes and Noble has asked for 200 books to be sent to some of their stores in Los Angeles so I’m working with a local publisher who also acts as a distributor, Angel City Press, to get the books to them. You can’t just send the books to these bookstores yourself. They always need a middleman, the distributor, to pass them along. I will be presenting the book at the Los Angeles Times Festival of Books at USC in the Angel City Press booth. It's the biggest book festival in the country and the first time I've been to it. Also, I'm very excited that Pau will be speaking about our book on the Hoy stage and will do a book signing afterwards. The NBA just did a couple social media posts on their twitter and facebook accounts about the book. They have 29 million plus followers so hopefully that will translate into some sales. This has been such a challenging, yet so rewarding journey. I’ve learned more than I could have imagined. Thank goodness I didn’t realize how daunting it would be; otherwise I may not have taken the first step. But thank goodness I did, and in my heart, I know it is a huge success. Sometimes a leap of faith is needed with creative projects like this. Entering a world that was unfamiliar to me was so exciting and creatively rewarding. Pau is extremely happy for how it turned out and so am I. Now I’m on to the next series of books about my famous cat, City the Kitty, (who has over 265,000 loyal followers on facebook) with a whole lot of knowledge and a wealth of book creating and publishing in my back pocket.